Factory Pattern is a creational patter. It provide encapsulation by hiding the complex components and their dependencies from the client. 1. A class can’t anticipate the class of object it must create. 2. Client don’t need to use lot of new keywords. 3. Classes delegate responsibility to one of several helper subclasses. 4. If you want to develop a data layer that supports many types of database products, it should not be tightly coupled with a particular database product or ADO.NET data provider. Ex: we will be creating an Employee objects. As with good OO design we will start with an interface. 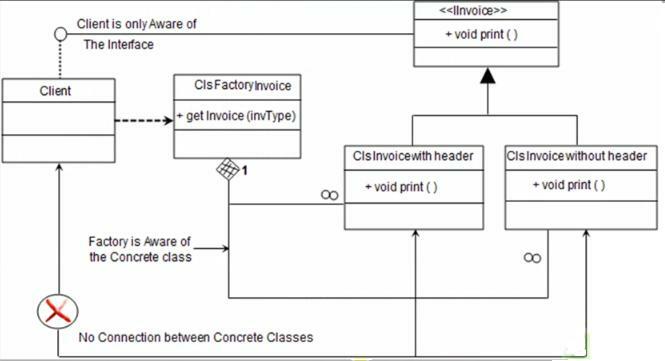 Now factory class, it is static and contain one method to return the correct object. Now Client section: there are two buttons “IT EMployee” & “HR Employee” and two labels lblDept & lblEdu. Now our factory class, it is static and contain one method to return the correct object.